Can You Say "Cocina Mexicana?" I developed this authentic Mexican recipe collection because I needed it. Bad. If you're anything like me, you've got a real love affair going with Mexican food. I grew up in southern California. Mexican food is in my blood. Go too long without it, and I start jonesin' for a whiff of cumin, the bite of salsa verde, the inescapable corny flavor of fresh tortillas. I've always loved Mexican food, and I thought I knew it. But then I moved to Mexico. Imagine my surprise when I discovered that real, authentic Mexican food has about as much in common with Cal-Mex or Tex-Mex as Chop Suey does with authentic Chinese food. It just ain't the same. It's better! Now, when I'm not in Mexico or near a truly authentic Mexican restaurant, I have to go in the kitchen every so often and whip up the real deal using some authentic Mexican recipe I've scoped out and proven. This is especially true at holiday time—any holiday— because in Mexico, most of them have traditional foods that are an inescapable and wonderful part of the holiday celebrations. That's why many of the authentic Mexican recipes in this collection are for special holiday goodies—Pan de Muerto for Day of the Dead, Rosca de Reyes for Three Kings Day, hot ponche for Christmas. Check these out and soon you'll be whipping up your own comida Mexicana using a Mexican recipe just like Tia Guadalupe's. Just click on any recipe title below to go to its page. Atole is a delicious hot Mexican drink made from masa—corn flour—or cornstarch. It's eaten any time, for breakfast, lunch, dinner or in between, but it's especially popular for Day of the Dead, at Christmas or for Candelaria. If you think guacamole is the mashed up, pureed, vaguely avocado-y slop you get in a lot of U.S. restaurants, you ain't never had real "Guac." Here's a recipe for the genuine article... and it's to die for. When I first heard about this traditional Christmas Eve/New Year's Eve dish made with salt-dried cod, I though "Eeuuw." But then I tried it—delish! Give it a shot. This delicious Mexican bread pudding is nothing like the bread pudding Mom used to make—unless you're Mexican. It features bread, raisins, fruit syrup and cheese. Yep, cheese. 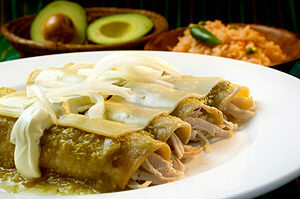 And this authentic Mexican recipe makes it delicious! If you've ever eaten in The Café San Agustín in San Miguel de Allende, you've probably had some truly heavenly churros, the long, slender fried "donuts" usually served with hot chocolate. they're enough to make your diet history. This is a surprisingly easy recipe. Seen on every day of the Dead ofrenda or altar, carried to the cemetery on that day, eaten as part of the family celebration, Pan de Muerto is delicious and very traditional. You'll be eating a piece of Mexico's colorful history. It wouldn't be Christmas without ponche—the hot Mexican punch heady with fruit flavors, and sometimes with rum, too. Great for your holiday parties. - Will you get the plastic baby hidden in this delicious fruit bread served on Three Kings Day? If so, you'll need the Atole Recipe, too, because you'll have to host the Candelaria party. - One of the first things I ate in Mexico and it was love at first sip. The last time I made this recipe, Allen, my partner, called it "scary good." It really is. Definitely forget the diet! This cake is rich, drippy moist and fabulous. Great for a birthday cake! This is a dynamic page. I'll be adding recipes regularly, whenever I find one I really like, one that just says "Mexico" to me. So check back regularly, try out an authentic Mexican recipe, tell me which ones you love and what ones that don't work. Then... add your own favorite Mexican recipes. C'mon, don't be selfish. We want to taste your best. Click this link to send us your favorite Mexican recipes.